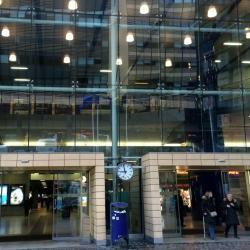 Looking for hotels near Rue Neuve? Located in Brussels, 16 feet from Rue Neuve, All In One has a terrace, a shared lounge and on-site dining, as well as free WiFi. 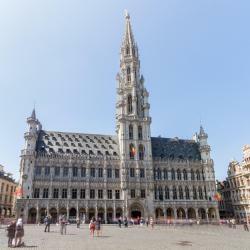 Offering free access to wireless internet, the self-catering Grand Place The Looks Apartment enjoys a central location in the heart of Brussels, 328 feet from the Grand Place and Manneken Pis. 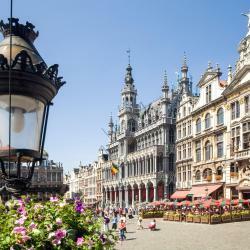 B&B BE IN BRUSSELS is a property with a shared lounge located in Brussels, within just a 3-minute walk of Place Sainte-Catherine and half a mile of Place St. Gery. The property features free WiFi. 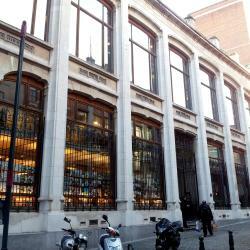 Located in a historical building in the center of Brussels, Hotel Hubert features air-conditioned rooms with free WiFi. Located in the Schaarbeek / Schaerbeek district of Brussels, FunKey Hotel is 1.5 miles from European Parliament and 1.7 miles from Belgian Comic Strip Center. Great place to stay in Brussels! Large rooms, friendly staff, free drinks and food all the day! Opening in April 2016, Hotel Agora Brussels Grand Placer is housed in a historical Brussels building dating from 1696, 722 feet from The King's House in the Grand Place. The front staff was extremely friendly. The check-in process was quick. Location was great! Historic features, luxurious décor and modern facilities are combined at Hotel le Dixseptieme, in the center of Brussels. 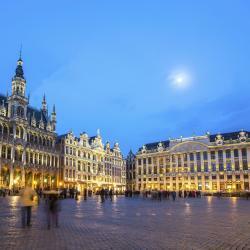 It is only 787 feet from Grand Place in the UNESCO World Heritage-listed area.... The staff were all excellent. Warm and very friendly. 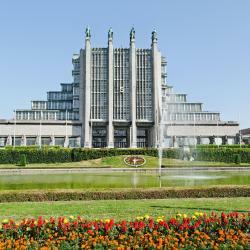 Offering free WiFi throughout the property, Yadoya Hotel is located in Brussels. The property is around a 7-minute walk from Rogier Square, 1969 feet from Rue Neuve and 2625 feet from Tour & Taxis. Very clean property and things look new and modern. 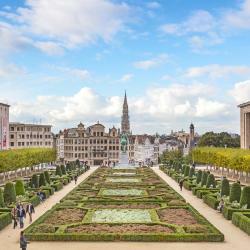 EasyHotel Brussels City Center offers accommodations in Brussels. Some units include views of the garden or city. All rooms include a private bathroom fitted with a shower. It’s super central and great value pricing. Offering free WiFi, Hôtel Méribel offers rooms in Brussels, a 13-minute walk from Belgian Comic Strip Center. The property is close to Rue Neuve, Mont des Arts and Place Royale. Everything was fantastic! Great family run business. Dansaert Hotel is located in Brussels, at the heart of a chic neighborhood 1312 feet from Grand Place Brussels and Brussels City Hall. There is a 24-hour front desk at the property. Every thing, clean and comfortable room, location is super! Nearby cafe, Grand Place, shops etc.. The elegantly designed Mercure Hotel Brussels Center Midi is conveniently located in the heart of city, a 5-minute walk from the Brussels-South Train Station with Eurostar and Thalys terminals. Awesome hotel to make our Europe trip even more awesome. On the banks of the Charleroi-Brussels canal in an old factory,designer hotel Meininger offers free Wi-Fi and a 24-hour front desk. The Grand Place is one mile away. The hotel room was good and we love everything about the set up in the room. 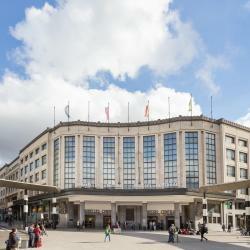 Hotels with great access to Rue Neuve! In a historic Belgian townhouse 185 yards from Brussels Central Train Station, the boutique-style 9Hotel Central offers classic accommodations with free Wi-Fi. Was a very nice place. Minimalist, but with a lot of texture, modern, clean, refreshing. Sandton Brussels is in the center of Brussels, only 100 yards from Brussels Central Station and the St Michael & St Gudule Cathedral. Comfortable bed and excellent Air conditioning. 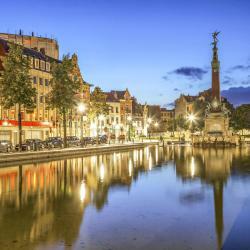 9Hotel Sablon lies in a quiet area of Brussels just over a 5-minute walk from both Grand Place and the Manneken Pis Statue. It features free WiFi and free international newspapers. The hotel is excellent for walks in Sablon area. People are talking about Rue Neuve! 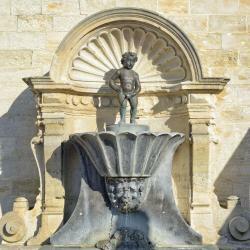 Explore guest hotel reviews featuring "Rue Neuve"
Very good breakfast, clean rooms. Good location, just steps from the Rue Neuve where you can find plenty of shops. Walking distance to North Train Station (direct access to the airport) and the Old Town. Metro access. Good location at Rogier. Metro/train just across the square. 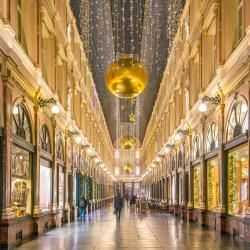 Very close to Rue Neuve with shoppings. Good breakfast. Excellent breakfast - value for money. Very good location- 5 mins walk to Grand Place or Rue Neuves.